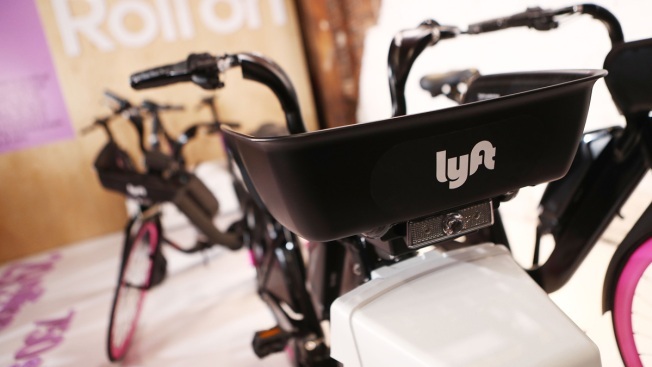 A Lyft bicycle is displayed on March 29, 2019 in Los Angeles. Rideshare company Lyft is temporarily pulling its electric bicycles from three major cities after some riders reported braking issues, NBC News reported. The e-bikes, which can be powered with electricity or by pedaling, have been removed from New York City, San Francisco's Bay Area and Washington, D.C. Approximately 3,000 of Lyft's 20,000 bikes in those three cities have been pulled. “After a small number of reports and out of an abundance of caution, we are proactively pausing our electric bikes from service in three markets. Safety always comes first,” Lyft spokesperson Julie Wood said in an email to NBC News.